Donald Trump will have to work with China or risk a "disaster." 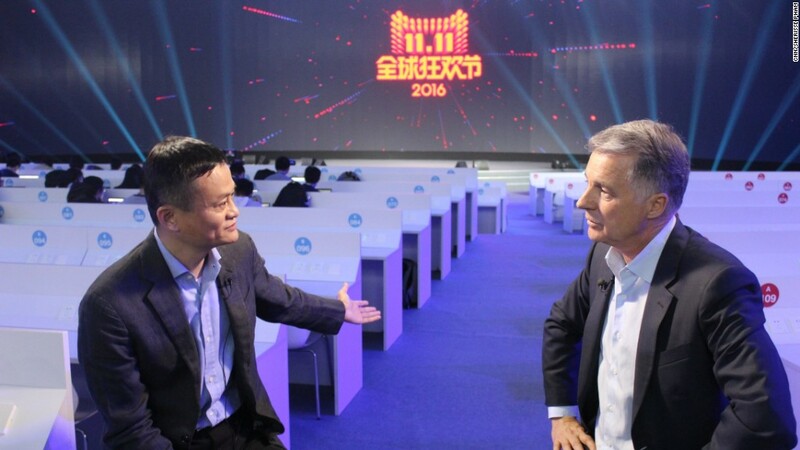 That's the view of Jack Ma, the founder and executive chairman of Alibaba (BABA) and one of China's richest men. A healthy and positive relationship between the world's top two economies could solve lots of problems, he said. "But if they don't work with each other it's going to be [a] disaster," Ma told CNNMoney in an interview Wednesday. Ma says he is optimistic that Trump will not carry through with campaign trail threats he made against China. The U.S. President-elect said he would name China a currency manipulator on day one of his presidency, and pledged to slap punitive tariffs on Chinese goods exported to the U.S.
"I don't fear [a Trump presidency], I think a healthy and positive China-U.S. relationship is so critical," Ma said. The tech tycoon said there is a clear gap between campaign rhetoric and the reality of the job of U.S. president. He said Trump wouldn't be the first candidate to make threats and not carry them through into the presidency. "Every time they talk about it. But I think when they become president, when he has that burden ... the world is not as simple as he thought." "He's a smart person, he will adjust," Ma said. "He will never neglect the relationship between China and America." Ma, who was a regular visitor to President Obama's White House, said he was looking forward to meeting Trump. He said the new administration should focus on trade and globalization to create more jobs, and improve the understanding between China and the U.S.
"We need to respect each other's culture and we should forget about what we have been doing in the last century," Ma said.